It is no longer enough to place an educationally sub-normal child in a special school, relying on sympathetic teaching to produce effective results. There must also be a secure family background, with each member aware of the ways they can give most help. St. Paul's Special School, built in Bootle 11 years ago, communicates with the parents as much as with the child. This is only part of their radical approach to the problem. The school has a weekly youth club, organised by parents and staff, to allow them to keep touch with former pupils who still need a lot of advice. It also provides useful social contact for children due to leave the school. 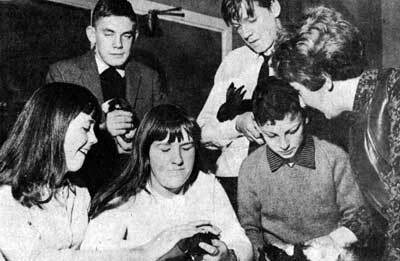 Rabbits and guinea pigs are popular in the handicrfts class. Teacher Miss Liz Plews is on the right. The success story behind each child proves that this common-sense method is the correct one. This makes it all the more surprising that it has not been adopted by similar schools elsewhere. Mr. George Newns, 56-year-old head of St. Paul's said: "We now want to encourage others to extend their influence outside school in the same way as we do." School inspectors have called for reports on the work, which is based on the assumption that admission to the school is not a surrender of responsibility. "On the day the child is admitted," said Mr. Newns, "I speak to the parents over a cup of tea in my study. 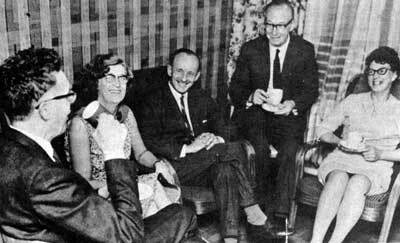 It appears to be an informal chat about the child and the family, but is in fact a carefully documented interview which reveals any areas where help may be needed. Our aim is to assist the whole family on a continuous basis." In the past, Mr. Newns and his staff have been able to help both physically and mentally handicapped fathers, aggressive mothers, too-strict parents, and those who just find it difficult to cope. This work is vitally important since a bad home life may actually be the cause of sub-normality. Certainly it aggravates any existing maladjustment. "We often visit parents in the evenings," said Mr. Newns. "We find we're usually more readily accepted than official Town Hall visitors. People seem to realise that we're not seeing them because it's our job, but because we genuinely want to do what's best for the child. "If necessary we can arrange for parents to meet someone from the appropriate department. They might have a housing problem, health difficulties, or require some other advice. You could say we're all part-time social workers. Of course some teachers think this is outside their scope and insist on mere academic progress. This is no good to us. Our staff have to be interested in the whole range of child development." Mr Frank Breen, youth club leader, Mr Charles Baker and Mrs Doris Moore. Mr. Newns came to Bootle with the opening of St. Paul's after ten years of special school experience in Liverpool. The 120 pupils are aged between six and 16 and include maladjusted children, late developers, those who've missed early schooling through illness, and some slight spastics. A certain number will progress so well that they will go on to normal secondary schools. The Wednesday night youth club, held in the school hall, developed five years ago from a discussion group for senior girls organised by Mrs. Margaret Roberts, who taught domestic science at the school at the time. The staff have been surprised at the number of fathers taking an interest in the venture. Former pupils attending the club can be given advice on problems connected with their personal lives, and with their first jobs. Others are regular visitors during the day, apparently reluctant to lose contact with the school which helped them so much. "Even after they're married they keep coming back," explained Mr. Newns. "I often have toddlers sitting on my desk. I had a lad in the other week asking me how he went about getting married. They come back and they talk to those who are still here, and this is a great help." The curriculum aims to make the children self-supporting citizens, fitting them for the undemanding jobs which most of them will go into. They acquire a certain competence in reading and the use of numbers, and master relatively difficult tasks such as telling the time, working out a daily budget - and becoming familiar with Bootle streets. Acting as careers master, Mr. Newns is careful to find jobs which suit each individual's ability. A recent survey showed that children from St. Paul's tended to find work more quickly than those from other schools - and would probably keep these first jobs longer. They become labourers or factory workers, sewing machinists or cleaners. Some go into the forces. One boy is now in the Irish Guards, another in the Lancastrian Brigade. And one who joined the Merchant Navy has saved £1,000 to set himself up in business as a haulage contractor. The excellent relations between parents and staff find expression in the school's Friends Association, which raises £100 annually for additional games and equipment. It also organises youth club outings and trips to pantomime or zoo for younger pupils. It is one way in which parents can express their appreciation of the often amazing progress made by their children. One mother who regularly helps with the youth club, Mrs. Gladys Finnegan, of 68 Exeter Road, has seen a big improvement in the reading ability of her 15-year-old daughter, Patricia. 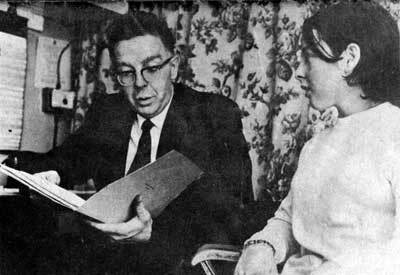 "She used to have a lot of difficulty reading," said Mrs. Finnegan. "But now it's her hobby. She reads everything she can get her hands on. Now we want to see if she can go in for some form of further education. One of the great things about this club is the way it brings them out of themselves. Pat's got a lot more self-confidence now, and she's getting to be quite a ready wit." For five years, while living in Bromsgrove, Worcestershire, Mr. Charles Barker tried to get special schooling for his 10-year-old son, Alex. He moved to Bootle last March to work in the Giro headquarters, and his problem was solved. "Right away Bootle offered my son a place at St. Paul's," he said. "And after the first week he'd read the first book in his life. I'm hoping he'll now do well. We were getting very anxious about him, but since coming here we're a lot happier. I can't speak to highly of the way Bootle organised this. It's an example to many other places in the country." Sheila Moore has suffered most of her life from an illness for which she will always have to take four tablets a day. She was a slow learner and had difficulty with her speech. Her parents moved from Kirkdale to Bootle just so she could attend St. Paul's. Now aged 17, she is enjoying her first job in a local supermarket. She gives up her half day to visit the school and help with the younger children and also gets additional help with her reading. The achievements of St. Paul's have been made possible largely through the fact that Bootle is particularly welfare conscious. Other authorities might not have the same degree of inter-departmental co-operation which has allowed the scheme to work so well. It is to be hoped that they will become aware of what is being done at St. Paul's, and will adopt and adapt these ideas for themselves and for the children.